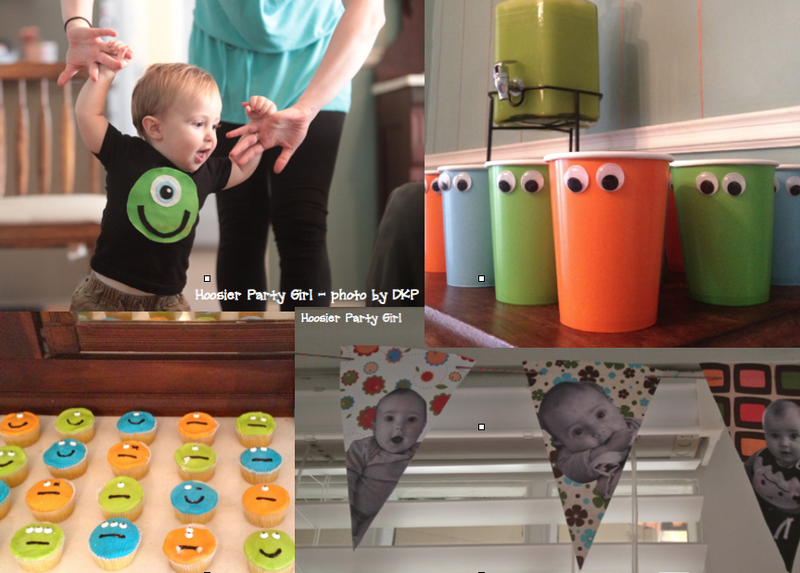 There was more to this monster bash than just the monsters I made, the first birthday bunting, and the monster food and drink. 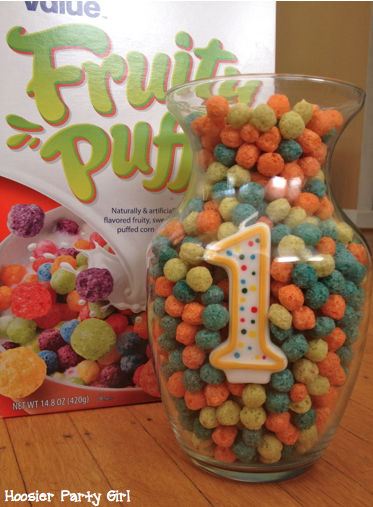 I made a centerpiece by picking out the cereal with the right color scheme for the party and displaying with a 1 candle. I used cereal because it is less expensive than candy – at least to get the right colors – and the birthday boy could actually eat it if he wanted. Can you tell I think a color scheme is really important? 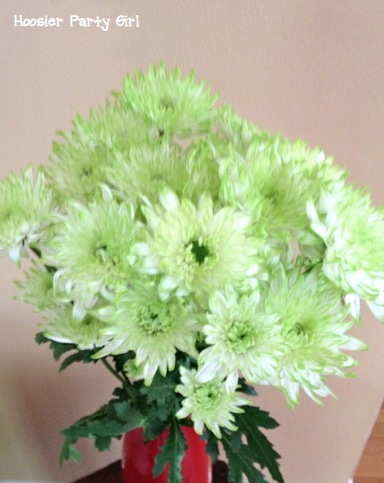 Even the flowers matched the color scheme – lime green flowers! There were balloons in all three colors. I’d intended to hang them, but I ran out of time so they were floor decorations and toys. 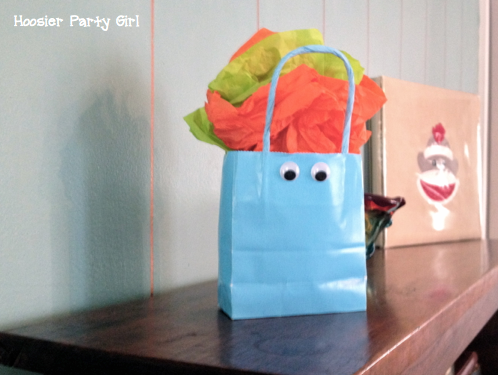 I couldn’t resist adding more googly eyes to my gift for the birthday boy. I also displayed his scrapbook (even though it’s not a monster theme). I caught one or two people looking through it. And perhaps most importantly, I hired Danese Kenon to photograph the event, so I get the gift of fabulous photos to frame for my family wall. 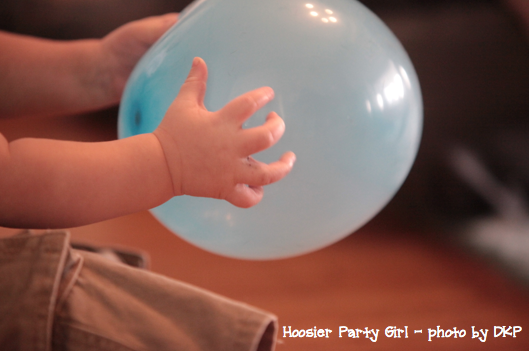 Every first birthday party needs baby photos. 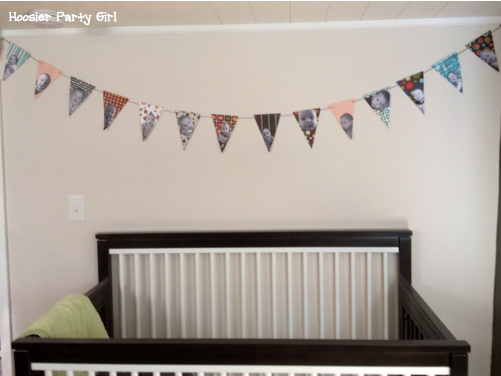 I liked the idea here of a guessing game of how old baby is in each photo month by month, but I knew our guests wouldn’t really participate. 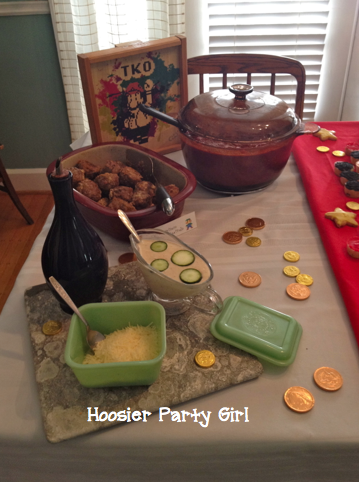 Instead, I used mommyinthemidwest as my “pinspiration”. Everything I needed for this project I already had at home, but if you don’t the supplies are fairly inexpensive. The most expensive part will be the patterned paper. 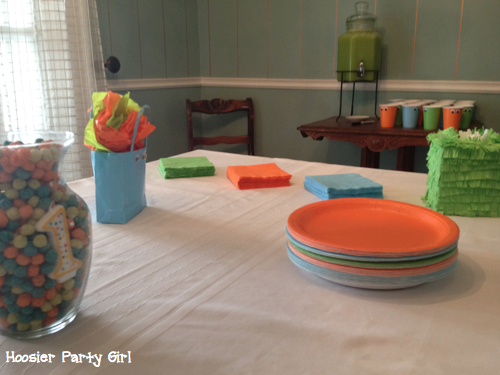 I had a slab of patterned papers that pretty closely matched my color theme of lime, orange, and light blue. The first step was choosing the height and width of the triangles for my bunting, which I did based off of the slab of papers that I had. 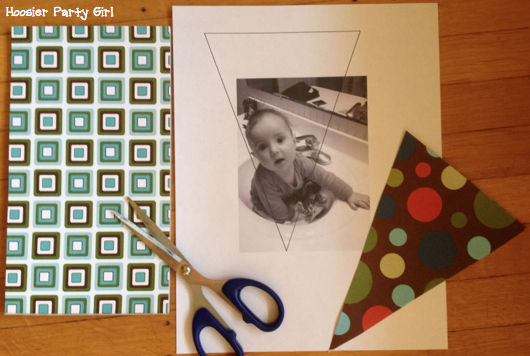 I created a triangle template in pages then adjusted each of my photos behind the triangle to make sure the baby’s face fit how I wanted it to. 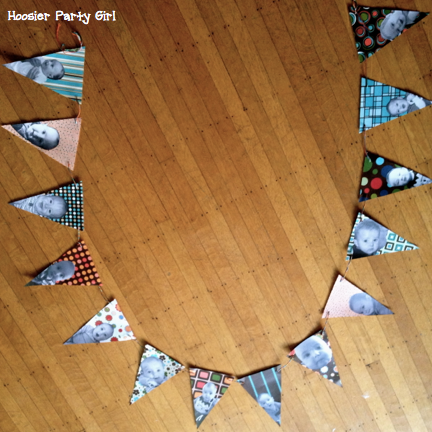 (Here is the triangle I created: bunting template) I turned all the photos to black and white in iPhoto. There is plenty of color in the patterned paper, and I wanted the focus to be on his adorable face. I printed each picture with the triangle, so that I could cut the photo out using the triangle guide and cutting all of the background out. I did leave the hands holding him in one or two, but mostly the photos are just the baby. The triangles also had to be cut by hand, but maybe you can figure out how to cut the correct angles with your paper cutter. Once I had the photos and the triangles cut out, I simple glued them together. My bunting is hung on a line made of three threads of embroidery floss (lime, orange, and light blue) twisted together. I used a large needle to simple “sew” it all into one line. Notice, that some of the photos are sized in a different place on the triangle. The majority are at the bottom, but some fit better a little higher. I like that it’s not all exactly the same. 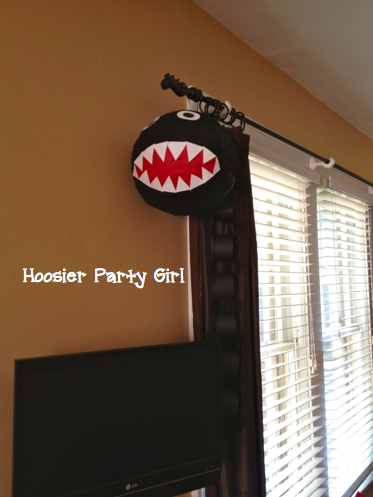 For the party, I hung it over the french doors behind the dining room table (where all the food would be). 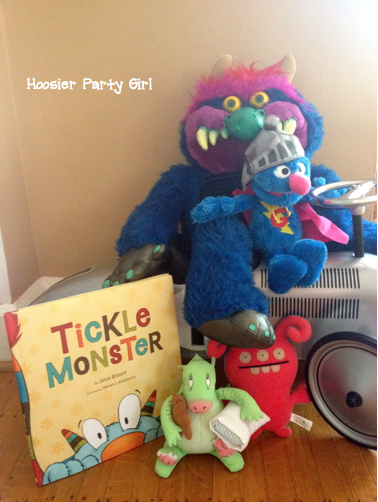 After the party, I moved it to the baby’s room because it is too adorable not to keep around as long as possible. It all started from the idea of the cake. 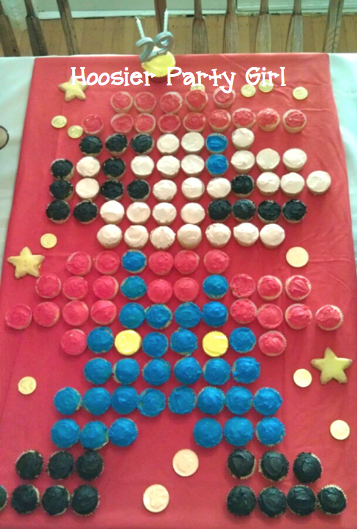 An 8-bit Mario made out of 143 mini cupcakes. Icing the cupcakes is what took the longest, but overall, it wasn’t so difficult. I substituted blue for his eye rather than black because I liked it better. (No one noticed). I have two amazing friends who helped me pull this all together. 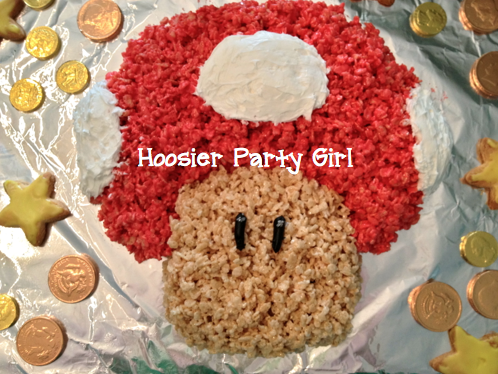 Katie made this amazing Rice Krispie treat because Rice Krispie treats are totally her thing; she makes some amazing creations. 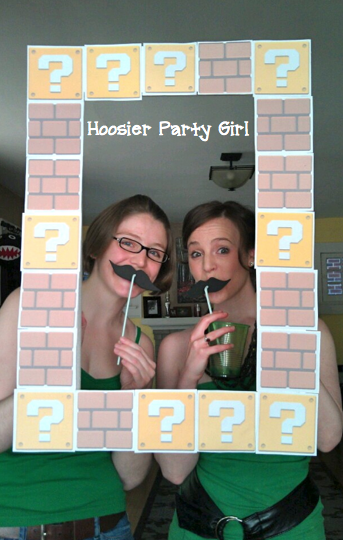 Notice our lovely Luigi-inspired party attire? 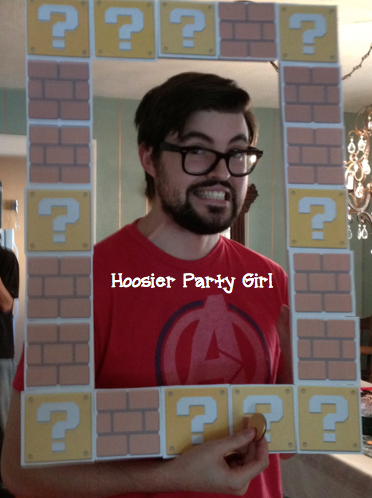 Click through to find out how to make your own Mario photo frame. Somehow Mina escaped the camera, so I’ll share a photo of her husband Josh instead. Mina has an old Italian recipe for marinara and meatballs. Best marinara and meatballs EVER! 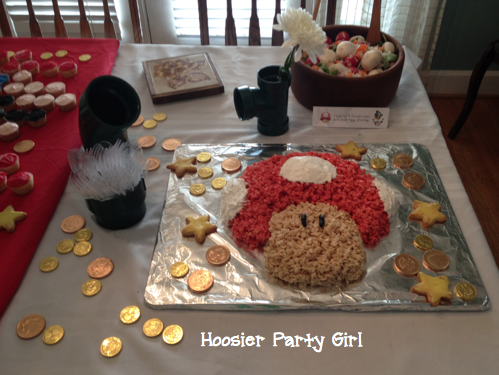 Not only does it fit for the Italian plumber theme, but it also happens to be the birthday boy’s favorite meal. 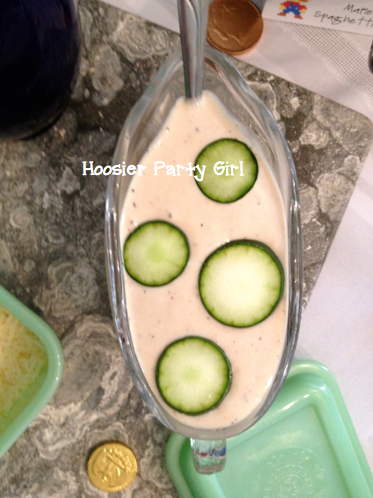 with “Yoshi egg dressing” – those are just slices of cucumber on top of the salad dressing, served in a gravy boat to be more egg-shaped. Did you notice the green pipes that held the utensils as well as served as decoration? 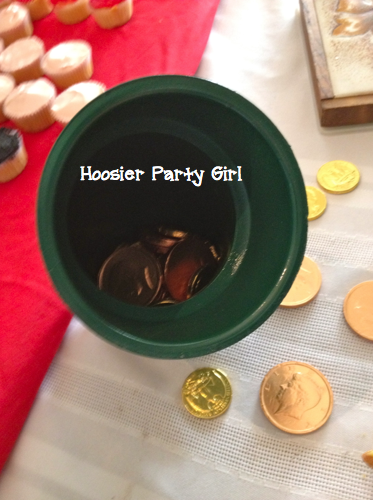 We also filled one with gold coins. 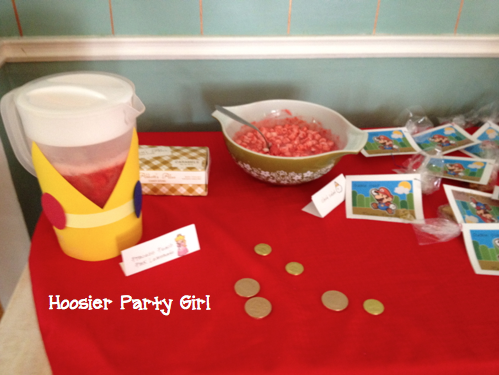 There were (chocolate) gold coins spread all over my house! It certainly helped with the Mario feel! Katie and Mina got the tables ready while I was finishing up juicing the strawberries and lemons for the “Princess Peach Pink Lemonade” and cleaning up from the failed pin. Behind Bowser, you can see a jar of Mario fruit snacks (because they were on sale) and Yoshi Eggs. 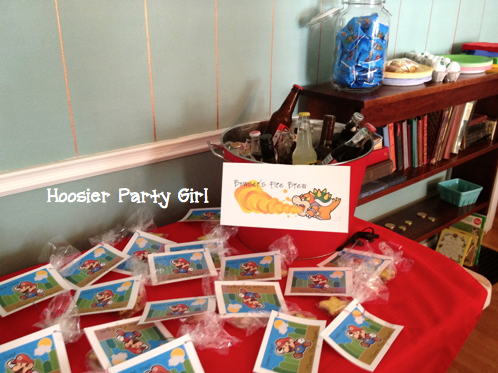 or the Mario mustache cups! 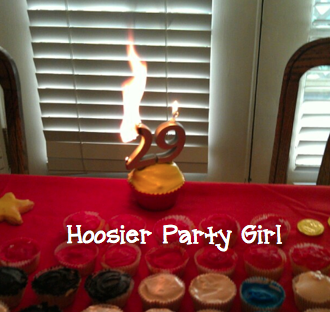 I hope you can tell that we had a great time, despite the fire…. P.s. 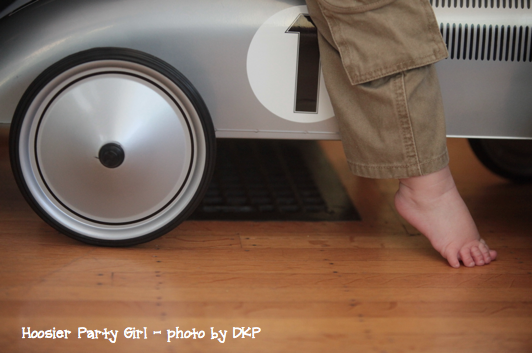 If you haven’t seen my new header, you should check it out! 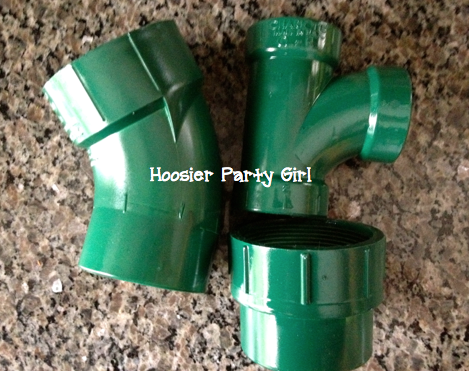 What Mario theme party would be complete without green pipes? 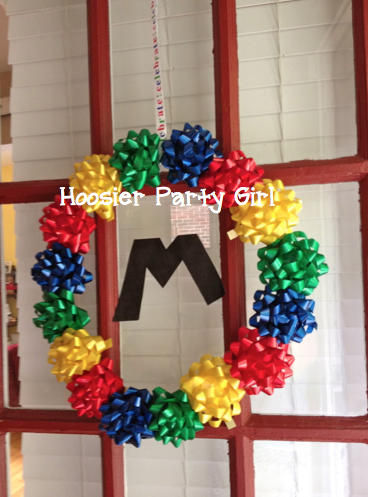 A quick trip to your local hardware store is all you need for this easy decoration. 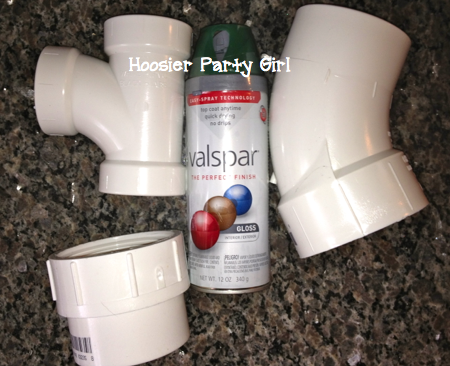 I chose three pvc piping connector pieces that I thought would look nice. I chose them based on look, but also based on price. There is a wide variety of prices and options, depending on size and more. 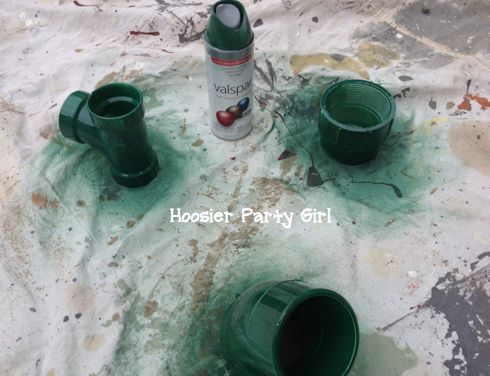 I also grabbed a can of green spray paint. That’s all you will need, although a drop cloth helped. On Saturday, in between catching up with work and cleaning the house, I sprayed three coats of spray paint on these little guys. I also sprayed something for another project for this party, and I spray painted a lamp for my new office. It was a productive day. 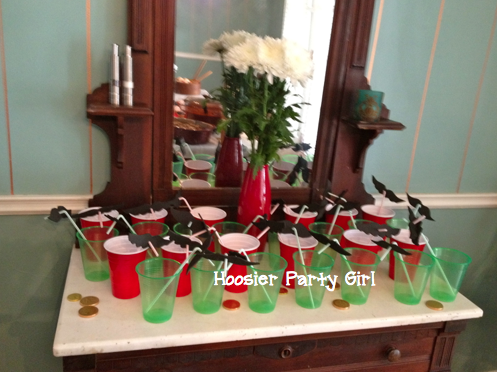 I have several ideas of how I will use these at the party. 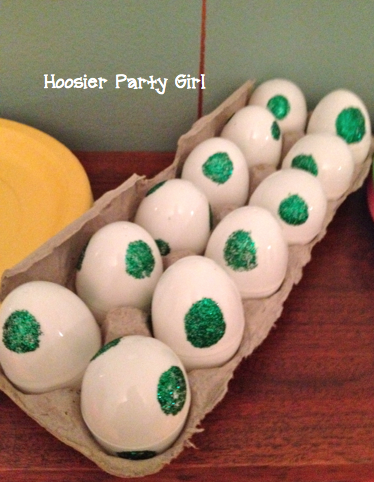 They are probably not large enough to hold snacks, but they could hold decorative Yoshi eggs. They could also be used to hold fresh flowers, plastic ware, or napkins. 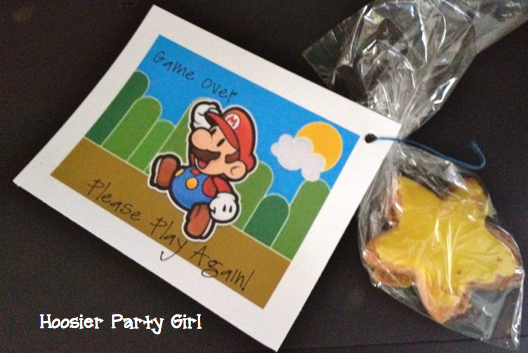 Regardless, they will be an easy decoration for my Mario Brother’s theme.